With 12 incredible days of steam action and some of the hottest days in the US Midwest since the 1930’s, we could not think of a better name for our 3 Volume Steamin’ Summer video project. QJs to Rock Island - Iowa Interstate Railroad’s two Chinese QJs traveled to the festival as a double-header, the first day with a passenger consist from Newton to Iowa City. The next day they brought a record-setting 55 car freight train to Rock Island. We get the first look at QJ 6988 after mostly cosmetic changes and a new whistle made it appear and sound more like a North American steam locomotive. NKP 765 to Rock Island - we cover a portion of Nickel Plate 765‘s journey across Indiana on the Toledo, Peoria & Western Railway. The scorching heat actually caused the entire railroad to shut down for part of the day. Silver Creek & Stephenson - the Freeport, Illinois operating railroad museum conveniently scheduled a Photographer’s Special between the events at Little River Railroad and the Rock Island Train Festival. Great steam action provided by a 1912 Heisler, plus a Brookville “critter” and antique cars and trucks. Rock Island Train Festival - Days 1 & 2 - This one-time event brought together 7 steam locomotives, historic and modern diesels and more to a Mississippi River site in Rock Island, Illinois. 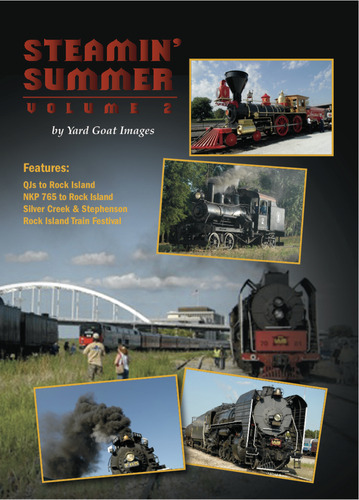 The festival featured daily steam trips to Walcott, Iowa and all-day trips to other destinations pulled by steam and diesel. This chapter features Day 1 Walcott trips pulled by NKP 765 and QJ 6988 from onboard and trackside, and the all-day Bureau, Illinois excursion with 765 on Day 2. We also capture the excitement on the festival grounds both during the day and after hours, and a cab ride in 765. Steamin' Summer Volume 2 DVD - Yard Goat Images from Yard Goat Images on Vimeo.